Have you ever scanned the radio looking for some music that fits your specific mood at that moment? Well, that’s the daily quandary for show host John Avery. Thus the creation of ‘Raiding The Crates on DC Radio’, a weekly two-hour ride through John’s wildly diverse music taste and genre-hopping music collection. Be prepared to hear shows ranging from Southern Soul & Blues to House Music. Hear songs by artists from Frank Sinatra to Frank Ocean; from Sarah Vaughn to Fantaisa; from Al Green to The B-52’s. John is all over the place, but never too far from his first love: MUSIC. If you’re the least bit adventurous, make it a point to join him weekly for “Raiding The Crates”. John Avery hails from Nashville, Tennessee and is currently a resident of Washington, DC. He is a thirty-seven year television production veteran, who started his career as a local news videographer in Knoxville, Tennessee, continuing with stints in Raleigh, North Carolina, where he moved from news to entertainment and documentaries. This led to a fifteen year residency at BET (Black Entertainment Television), where he met and worked with many of the music idols that are featured on his radio show, ‘Raiding The Crates’. 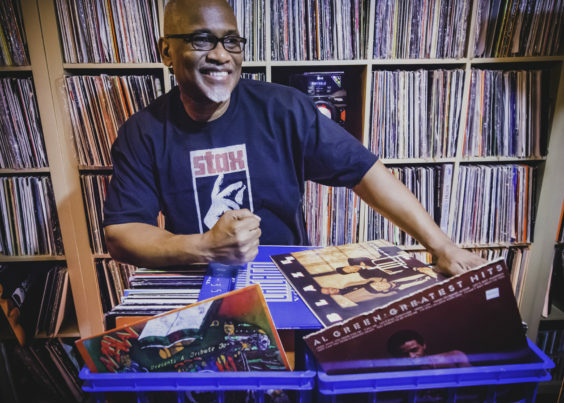 John has spent the last 16 years working for the DC Office of Cable Television, Film, Music and Entertainment, where he serves as the Studio Production Manager, all the while supplanting his love for music as a ‘multi-genre hopping’ DJ. His DJ motto; “If you request it, chances are that I have it”.